(MENAFN - DailyFX) EURNZD CURRENCY VOLATILITY TALKING POINTS: EURNZD could garner the attention of forex traders considering high-impact economic releases expected with German ZEW Survey of Expectations and New Zealand Consumer Price Index on deck for tomorrow EURNZD overnight implied volatility remains muted, however, with the 1-day price action measure sitting at 7.1 percent headed into Tuesday's session Check out this article for information on the Top 10 Most Volatile Currency Pairs and How to Trade Them EURNZD overnight implied volatility remains below its 6-month average of 8.25 percent despite upcoming economic data out the Eurozone and New Zealand that has historically caused sizable market reactions. The German ZEW Survey of Expectations will be released at 9:00 GMT and looks to provide a health-check on economic sentiment in the Eurozone while New Zealand's latest inflation reading will cross the wires later in the session at 22:45 GMT. Implied volatility measures have dropped elsewhere in the forex market, too. Sterling implied volatility took a nose-dive following the latest Brexit development pushing the UK's departure from the EU back from April 12 to October 31. Although, rising market sentiment and collapsing volatility has bolstered the relative attractiveness of some currency crosses such as AUDJPY for possible carry trades. Another possible factor causing a lack of expected price action this week in particular could be forex traders stepping away ahead of Easter Sunday. On the other side of the equation, New Zealand inflation could cause EURNZD to swing later in Tuesday's session if NZ CPI materially surprises. Inflation reported above estimates has potential to boost the New Zealand Dollar while a number below expectations could put downward pressure on NZD . 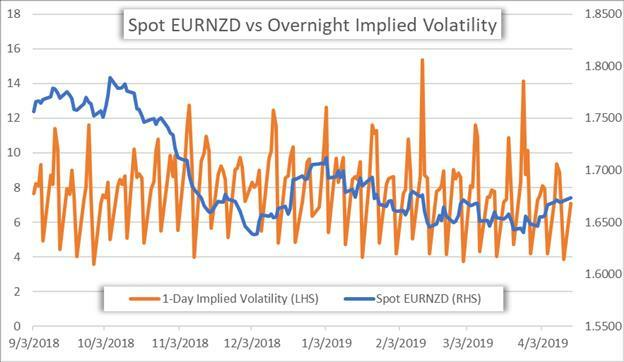 EURNZD PRICE CHART: 4-HOUR TIME FRAME (MARCH 25, 2019 TO APRIL 15, 2019) EURNZD overnight implied volatility suggests that the currency pair will trade between 1.6671 and 1.6795 with a 68 percent statistical probability. Interestingly, the 1-day implied high and implied low line up almost precisely with EURNZD's recent top on April 11 and the 23.6 Fibonacci retracement line drawn from its low on March 26 to this month's high. As such, price action tomorrow could provide possible range-trading opportunities if spot prices continue to hold this recent range.